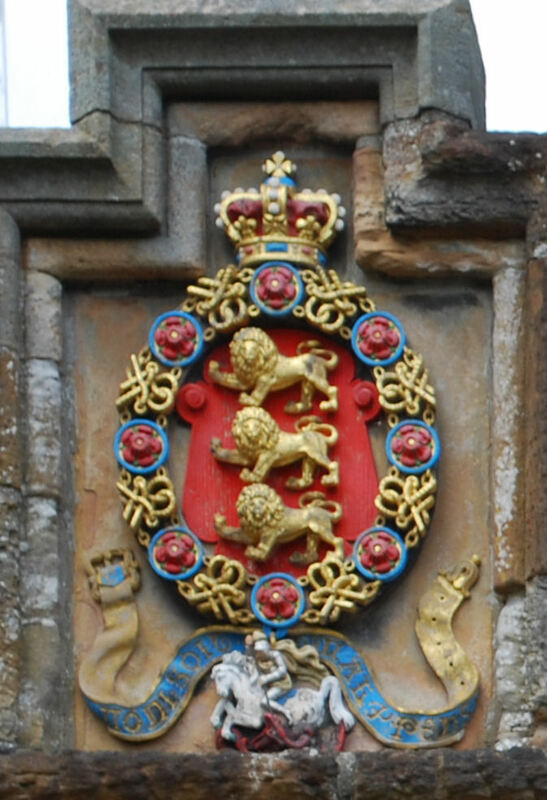 In addition to the explanatory signs at Rothesay Castle with their display of heraldry, there were also a couple of Royal coats of arms which had been incorporated into the fabric of the building itself. 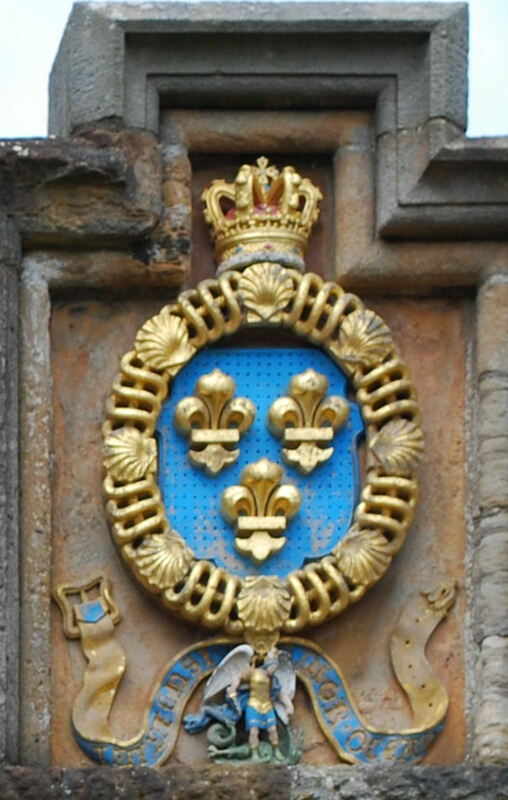 The older of the two is a very weather-worn carving of the Royal Arms of Scotland. Indeed, it is so very weather-worn that it is very difficult to make out most of the elements. The real clues to its identification are the unicorn supporters on each side of the shield and the crown above it. The other Royal heraldry was a lot easier to make out. It is, of course, the arms for use in Scotland of His Royal Highness, Charles, the Prince of Wales and Duke of Rothesay, consisting of the Royal Arms of Scotland with a label (as the heir of the Sovereign): Or a lion rampant within a double tressure flory counter-flory gules, in chief a label of three tags azure for difference. It was a wonderful display of the continuity of arms over the centuries in a single historic site. The final day of our heraldic tour of western and central Scotland took us to the Isle of Bute, where our first stop was the (remains of) Rothesay Castle. As you can see from the picture above, it isn't quite the edifice that it once was, and the seagulls of Scotland seem to have no more regard for castles than do the pigeons of, say, New York City or Florence, Italy, for the statuary in those metropolises. Still, at one time it was a major fortress, and a key in the defense of western Scotland. And, of course, there was some heraldry. The first that we saw was on an explanatory sign which touched on the history of the castle, and had a depiction of the Royal Arms of Scotland. 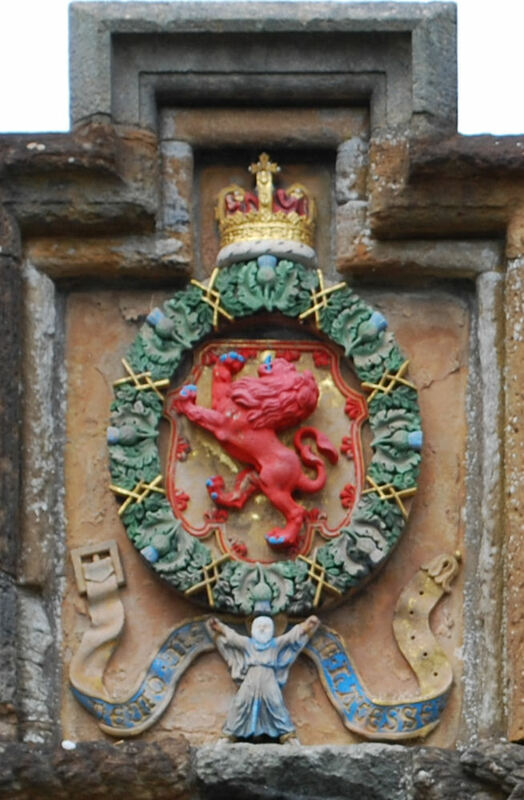 It's an unusual depiction of the arms, as the unicorn supporters have been reduced to but one, and that one lying underneath the arms, while instead of mantling there are two Scottish thistles issuing from the upper corners of the shield. An uncommon depiction, then, but with a bit of whimsy to it which I found refreshing. 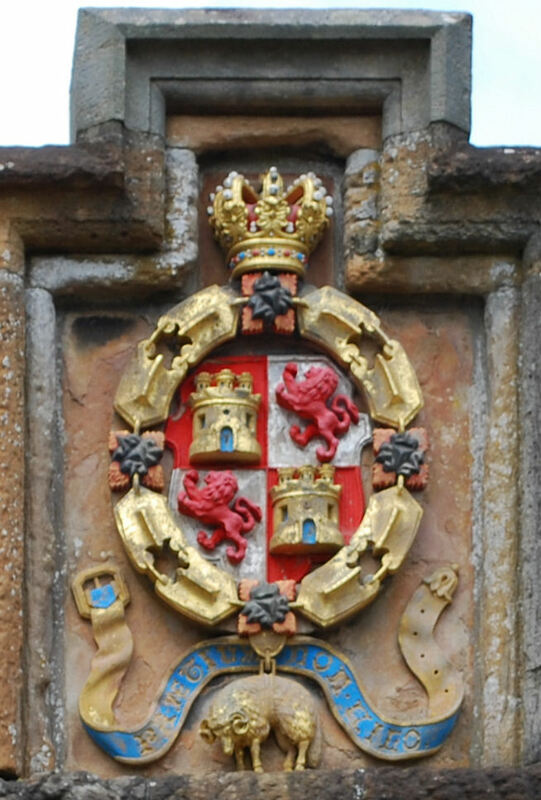 The other explanatory sign had a discussion about the city which grew up around it the castle, the Royal Burgh of Rothesay, with another depiction of the Royal Arms of Scotland and of the Burgh. I am always somewhat gratified to see the use of heraldry on signs which are erected to give some context to visitors to a site, especially as most tourists have little knowledge of (or, to be honest, much interest in, our busload of heraldists notwithstanding) the heraldry related to that site. Carved with a date of 1675 and surmounted by a thistle, it appears to be a piece that was rescued from an older building and incorporated into the wall of a new building, probably the one that replaced the older one. The arms appear to be those of Crawford, Dean of Guild in Linlithgow, as cited in An Ordinary of Scottish Arms from Original Pre-1672 Manuscripts. Crawford is blazoned as Gules a fess ermine between two mullets argent in chief and in base a stag's head cabossed or antlered sable. The arms are cited as 1672. Not only is this a really nice display of heraldry, but I think it's great to see an historical artifact of this type rescued from demolition and recycled into the fabric of new construction as a way of retaining the history of a building or place when making repairs or replacements. Don't you agree? Many of the windows on one wall of the courtyard of Linlithgow Palace have pediments displaying the symbols of the Stewart royal family. These are yet another nice display of some of the symbols of royalty, of genealogical descent, and a way of visually expressing the importance of the royals who lived in this palace. Finally! At long last, it is done! Nearly three years ago I began to collect into a single document personal heraldry (coats of arms and crests) as used in what is now the United States of America, from a number of different collections. I did this because I sometimes found myself having to look through three, four, five or more different books (some .pdf, some hard copy) when trying to research a coat of arms used here, and I wanted be able to have a handy single source to do this research. I think it's finally ready for use, and consists of 9,990 separate entries. Now that it is completed, I can share my work with others who may also find it useful, without having to recreate it from scratch. I have uploaded two .zip files to my website, Appleton Studios. One contains a .docx and a .xlsx file: the first is an explanatory document giving the collection's rationale, with an explanation of my attempt to make the blazons consistent, along with a bibliography of the sources I've used and a key to those sources (so read this document first! ); the second is the actual collection with surname, blazon of the arms, blazon of the crest (if given in the source), and the source of each. This .zip file can be downloaded directly from the Appleton Studios website at http://www.appletonstudios.com/American Heraldry Collection (xlsx version).zip. Because I know that not everyone can open Microsoft's .docx and .xlsx files, I have also saved each file as a .doc and .xls file. The .xls may be slightly more limited in how it can be manipulated, but contains all of the same data, and really, that's what's important, right? The zipped .doc and .xls files can be downloaded at http://www.appletonstudios.com/American Heraldry Collection (xls version).zip. Both files can also be downloaded from links on the "What's New" page (http://www.appletonstudios.com/whatsnew.htm) and the "Free Stuff" page (http://www.appletonstudios.com/freestuff.htm) on the website. If you find these files useful, great! If you find an error (or errors; I don't claim to have caught every single typo or other mistake (as I often say, "I am a prefect tpyist; I never make mistrakes"), though I have tried very hard to find and fix them), please email me and let me know so I can correct it (or them) and upload the corrected files. And, of course, if you find another source which blazons personal arms used in the United States that is not included in this collection, let me know about that, too, so they can be added and the collection updated. Passing through the gate with the four Royal coats of arms, we pass into the interior of Linlithgow Palace, and find ourselves in the courtyard with a very elaborate fountain. The fountain was built in 1537-38 by King James V and "symbolized [his] power and sophistication" (according to the explanatory sign discussing it). A lot of restoration work has been done on the fountain, most recently from 2000 to 2005. At that time, only three of the figures around it were original; you can tell the differences between the older remaining figures and the newly-restored ones in the next photograph. The original fountain and its allegorical figures (e.g., the mermaid symbolized eloquence, the drummer, music, etc.) would have been brightly painted. But, of course, it was what was the heraldry on the fountain that really attracted my eye. 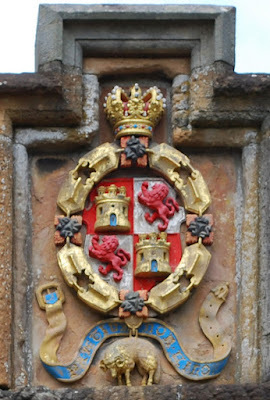 It's not carved into the shields now, but the explanatory sign with a drawing of what the fountain probably looked like when it was new has two unicorns gorged with a crown and chained (supporters found in the Royal Arms of Scotland, and now one of the two supporters in the arms of the United Kingdom) holding a shield with the arms of St. Andrew, Azure a saltire argent. There is also a lion holding the Royal Arms of Scotland, Or a lion rampant within a double tressure flory counter-flory gules, with the shield being crowned with an imperial crown matching the one atop the entire fountain. All in all, and even in its heavily restored and unpainted condition, this fountain is an impressive display of might and majesty. And heraldry. So, having failed miserably at identifying two coats of arms on a large candelabra in St. Michael's Church in Linlithgow, Scotland, this time we exit the church and head a little way up the hill to the gateway to Linlithgow Palace, which contains four coats of arms which I trust (nearly) no one should need a reference book to identify! This fore-entrance to the Palace was built about 1533 by King James V, and boasts the national arms of four countries surrounded by the insignia and mottoes of the four orders of chivalry to which James V belonged. All in all, a very impressive way to let people know just how important you are, don't you think? * The State of Texas uses a phrase with a similar, though perhaps a little pithier, sentiment in its anti-litter campaigns: Don't Mess With Texas. Not every ceiling boss in St. Michael's Church in Linlithgow, Scotland, is as colorful as some of those already posted in this blog. Indeed, some of them look like they are showing their age. This one, for example, though carefully carved with a lot of detail, appears to be a little worn (making one wonder, how much wear can there really be to something on the underside of a very high ceiling? It's not like people are walking on or touching it all the time) and completely without color. A little research, though, leads me to believe that it is a representation of the arms of Melville, Gules three crescents argent within a bordure argent charged with eight roses gules. Yes, I know that there are ten roses shown on the bordure here, but it isn't uncommon to find depictions of arms where the number of charges, especially on a peripheral charge like a bordure or surrounding a central charge, vary. 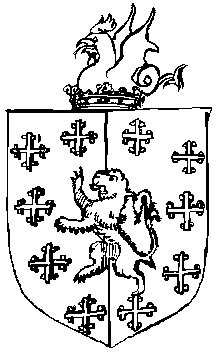 One example of this that I have run across is the different depictions of the arms of member of the Hutchinson family of colonial Boston, Massachusetts, whose lion is shown within a varying number of crosses crosslet: eight, nine, ten, twelve, thirteen (all more or less "in orle") (see a few examples below), and even semy, depending upon the artist. So I do not find it at all surprising that someone may have placed ten rather than eight roses on a bordure, as on the ceiling boss here. Just sayin'. Alexr Johnston of [this placename is hard to make out], Esqr. Argent a saltire sable on a chief gules three cushions argent a bordure also gules, with the crest An arm in armor holding in the glove a sword erect [all proper, according to Fairbairn's], and the motto Semper paratus (Always ready). Fairbairn's Crests cites this crest and motto and assigns it to Johnston of Straiton, but "Straiton" does not seem to quite match the placename as carved on the monument (which I can only partially decipher: I'm not certain that the first letter is an "S", though the second one looks like an "o" or maybe an "a", then there appears to be a space that might or might not be a letter, followed by a "u", and ending possibly with "ton"; in any case, the last letter is clearly an "n"). As a consequence of all this, I do not know who this Alexander Johnston is; I do not know how, or even if, he is related to Johnston of Straiton (the majority of Johnstons in Burke's and Fairbairn's use different crests and mottoes from the ones carved here); and so I find myself left with a bit of a mystery that really shouldn't be a mystery, because most of the information necessary to identifying him is right here on his memorial. So why can't I find him?